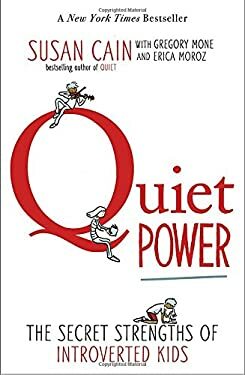 The monumental bestseller Quiet has been recast in a new edition that empowers introverted kids and teens Susan Cain sparked a worldwide conversation when she published Quiet: The Power of Introverts in a World That Can't Stop Talking . With her inspiring book, she permanently changed the way we see introverts and the way introverts see themselves. The original book focused on the workplace, and Susan realized that a version for and about kids was also badly needed. This book is all about kids' world--school, extracurriculars, family life, and friendship. You'll read about actual kids who have tackled the challenges of not being extroverted and who have made a mark in their own quiet way. You'll hear Susan Cain's own story, and you'll be able to make use of the tips at the end of each chapter. There's even a guide at the end of the book for parents and teachers. This insightful, accessible, and empowering book, illustrated with amusing comic-style art, will be eye-opening to extroverts and introverts alike.